This summer, experience a truly unique opportunity to learn Balinese music and dance on the island of Bali with the prestigious Gamelan Çudamani artist community. For the past 12 years Çudamani Summer Institute (CSI) has extended their educational reach by bringing hundreds of international students to their village Sanggar. This year again we are holding an International Summer Course of the Encounter in Ukraine. We are able to continue the positive development and popularity of this courses for over 20 years. It is a project that is carried out in close collaboration with the Orff-Schulwerk Associations of various Central and Eastern European countries, which is organized every year in a different country. This time we are guests of the new Orff Society of Ukraine, which was launched one year ago. This International Summer Course has a special theme and focus every year: This time, the theme lies on “Music and Dance Forms of the Baroque” in their artistic and pedagogically adaptations with the Orff-Schulwerk. Detailed information can be found on our website. The theme of year 2019 is “Hand in Hand – Käsikätehen – Käsikäes”. The main presenters are Polo Valléjo (Spain), Christa Coogan (German/USA), Elisa Seppänen & Soili Perkiö (Finland). Registration is open! Register soon to secure your spot for this incredible journey. Music Village Team is looking forward to meeting you in beautiful Estonia! Please, help us spread the word of our Music Village to the members of your association, Thank You! What is the Nunya Academy Summer Institute (NASI 2019)? 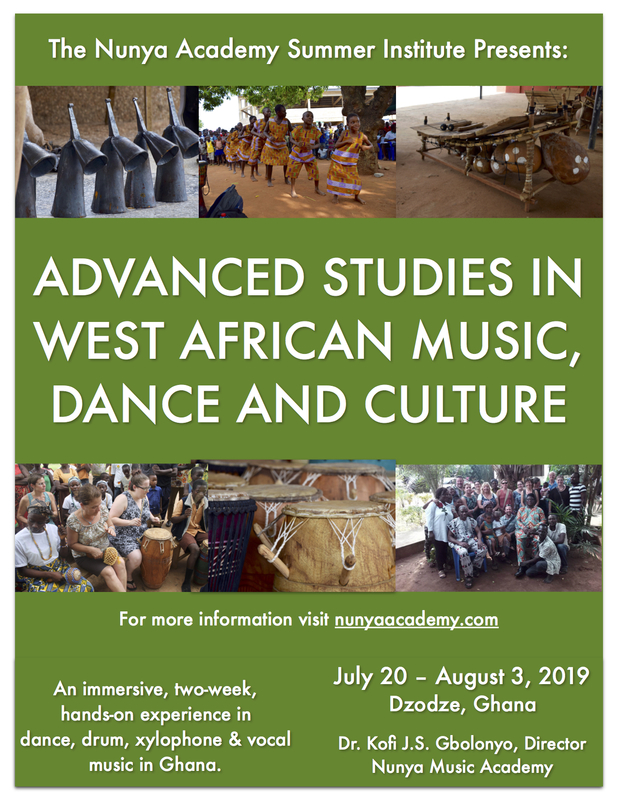 Inspired by an extraordinary gathering and successes of the Orff-Afrique Master Classes (2014, 2016, 2018), the 1st Nunya Academy Summer Institute 2017, and the 10th International Body Music Festival 2018, this UNIQUE summer course offers the opportunity for an immersive, hands-on experience in West African culture, dance, drum, xylophone and vocal/choral music in Ghana, the place where these musical traditions live and breathe. Dr. Kofi Gbolonyo, the course director, will lead a group of seasoned Ghanaian professors and esteemed local teachers to teach the course. With all participants, we will embark on practical and theoretical exploration of West African drumming, dancing, xylophone, songs and their histories, theories of rhythm, time and techniques right in my home town of Dzodze, Volta Region, Ghana. In addition to the daily workshops and lectures, there will be evening concerts and festivals, field trips and a chance to work directly with, teach and learn from Ghanaian children at the Nunya Music Academy. The International Orff Institute Salzburg is pleased to announce the 2018-19 Special Course “Advanced Studies in Music and Dance Education – Orff-Schulwerk” which will be held from October 2018 – June 2019 at the Orff Institute.